Ruling Justice and Development Party (AKP) İstanbul deputy and President Recep Tayyip Erdoğan’s former driver Ahmet Hamdi Çamlı mistakenly revealed on Thursday that he owns a Twitter account that previously appeared to belong to an unidentified female deputy. 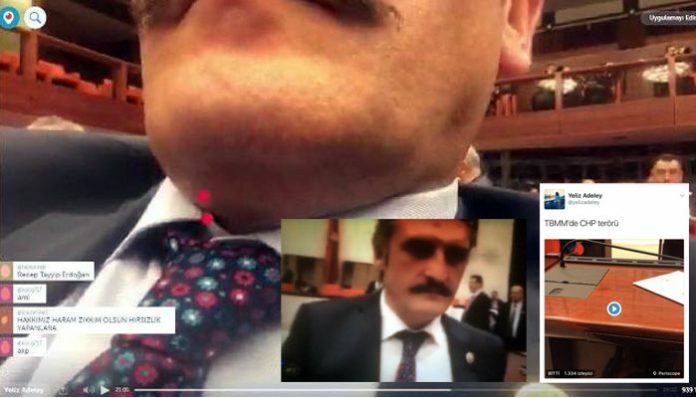 The Twitter account under the pseudonym of @yelizadeley, which used to share live streams of Parliament’s General Assembly meetings, was revealed as being managed by Çamlı after he mistakenly opened the front camera of his mobile while sharing another live stream from Parliament on Thursday. The last live stream from the @yelizadeley Twitter account, titled “CHP terror at the parliament,” showed Çamlı’s desk and his face after he mistakenly switched the video recording from the rear camera to the one in front. The Twitter account was closed following the incident. Çamlı, who also served under former Prime Minister and Welfare Party (RP) leader Necmettin Erbakan, had volunteered to be the personal driver of Erdoğan and served in that capacity for over 20 years. Failing to be nominated as a deputy candidate in the 2011 general election, he was elected as an İstanbul deputy from the AKP in the Nov. 1, 2015 snap election. During his election campaign in 2011, Çamlı proudly said that called Erdoğan “reis” (chief) as the two shared the same bed in a ward at Metris Prison when they served time in jail together 30 years ago. This article originally appeared in Turkish Minute on Jan. 20.